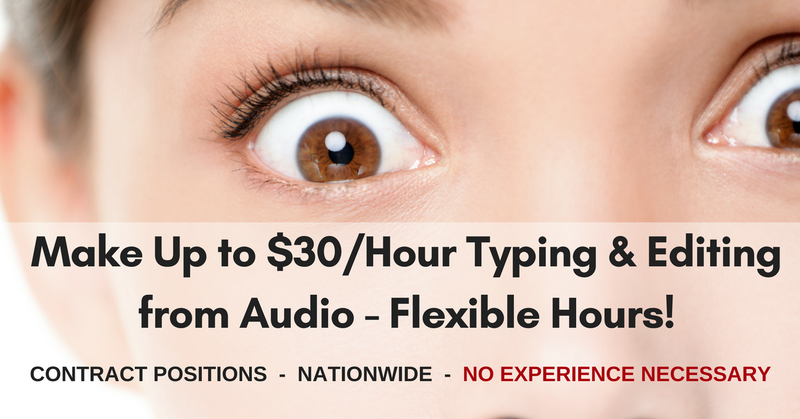 Make Up to $30/Hour Typing & Editing from Audio – Flexible Hours! 3PlayMedia is looking for contract transcriptionist / editors to transcribe recorded audio and edit imperfect transcription. We are looking for contract transcriptionists/editors to transcribe recorded audio and edit imperfect transcription using our proprietary internet-based software application. Since all transcription work is performed remotely, you will need a good computer and a high speed internet connection. As a contract transcriptionist/editor, you would decide which projects to accept, how much you work, and when and where you perform your work. To be a good candidate, you need to be able to provide expert transcribing services independently and be able to provide a quick turnaround on a finished work product (as a given project may require). In addition to the qualifications below, you are required to take and pass a series of proficiency tests to demonstrate your transcription skills prior to being engaged as a contract transcriptionist/editor. Remote – you can work from anywhere in the United States with an internet connection! Project-based; equivalent to $10 – $30 per hour, depending on your efficiency. Click here for full details and to apply. For more jobs like these, check our Newest Jobs & Gigs page. To be the first to hear about jobs like these, like our Facebook page and check your feed for our posts. May you be working from home soon! This entry was posted in Hiring Companies, Independent Contractors, Transcriptionists (Non-medical), Work at Home Jobs and tagged 3Play Media. Bookmark the permalink.